Grim Tales: The Final Suspect is rated 3.8 out of 5 by 27. Rated 5 out of 5 by JulzCat from The Savior Will Have To Save Herself! If you've played the previous Grim Tales games, you'll know that Anna Gray is constantly having to rescue her relatives from various creepy guys that want to destroy the family. In this game, it's Anna that's being hunted, and she'll have to use her supernatural skills to save herself and set things right. I thought the puzzles in this game were rather challenging. One of my favorites is where they put several puzzles, all working together, to solve one big puzzle. I really can't get enough of these games. Each one is better than the next! Rated 5 out of 5 by Kimmycoo from Best Ive Played in a While I wish there were more games like this one, where its like real life. Not kings and Princess and fake stuff that cant happen, not saying the subject matter in this could. Its just that I loved all of the people, the scenes. The apartment in this game was awesome. Scenes like the hospital, the city street. I wish there was more realism like this had. Like the Veronica Weaver game... There are so many places in the world a game could be made on, history that could be played through. A lot of times a games feels lonely, I like when there are other characters in the game standing by or in the scene even if they are a ghost. This game was the epitome of what I love about HOS. Great game! The artistry was fantastic! Rated 5 out of 5 by denniann2 from find the real murderer. aunt gray has worked with police in the past to solve murders by touching objects of the people involved and see what happened in the past. now there is a dead man in her house and the police think she has done it. with the help of her niece, she works to find the real murderer. the HO scenes are silhouette and regular ones and then finding items to unlock the regular item list. some of those scenes require some concentration to find the items. there is a custom level and an interactive map. good hint system. another one...i would say so. Rated 5 out of 5 by mikesilverman from Buy It. I purchased the CE ( collectors edition ) version of this game and was pleasantly surprised at how good the extra chapter was after completing the main game. It was at least as good if not better than the primary game. This game is not "easy" , you will have to carefully think about the clues and objects that you are gathering and where to use them. But it's not frustrating, it just requires a little more thought than a typical casual game. There are a lot of traditional "list" type hidden object scenes and all of the artwork is very well rendered. The ambient sounds are cool , sometimes employing chilling whispers and haunting noises, and the special effects are at times surprising and spooky. If you want a hidden object adventure that's a little more challenging than some of the others, this is the one. Rated 5 out of 5 by Shelly718 from Elephant Game Quality Elephant games are among my very favorite. They're consistently high quality; great graphics, pleasant music, exciting story lines. Grim Tales: The Final Suspect doesn't fall short. Intriguing story, interesting and diverse HO scenes (and not too many), great characters. Lots of fun puzzles, although I have to say they could be more challenging. I especially liked the way the story was divided into sections, like little mini adventures. I recommend this game. Rated 5 out of 5 by Yanie1020 from Two Puzzles Saved This Game From 4 Stars Puzzles are my favorite part of these games. This game has quite a few but most are ridiculously easy. The two puzzles that convinced me to give this game 5 stars are the ones where you have to figure out several different steps before the puzzle is solved. You figure out one, which leads you to the next step, which leads you to the next step, etc. These take me a while because I almost never succumb to using the hint button. Elephant Games are usually very good. This one is no exception. More of these complicated puzzles, please! Rated 5 out of 5 by pennmom36 from The Saga continues....... The Gray family has another crisis to deal with, this time it's Aunt Gray herself who seems to be in a pickle! With the discovery of a dead body in her living room, Aunt Gray calls the police, and passes out. Eventually, Anna Gray regains consciousness, but has no idea what happened, now we have a problem! Anna will have to travel back to her own past, and try to piece together clues, who is Howard Kelley. Why was Howard Kelley in her house, and most importantly, did she kill Howard Kelley, if she did, why? Grim Tales has given us another fantabulous episode of the Gray family saga. I do prefer the Collector's Edition over this Standard Edition which has Morphing Objects and Achievements to earn. Either edition has just about any feature you can imagine, an Evidence Panel, Panoramic Scenes, Dialog Options to choose, as well as Plus Sign interactive inventory items. As always, Grim Tales has superb graphics and one of the best whodunit, time traveling, mysteries available! 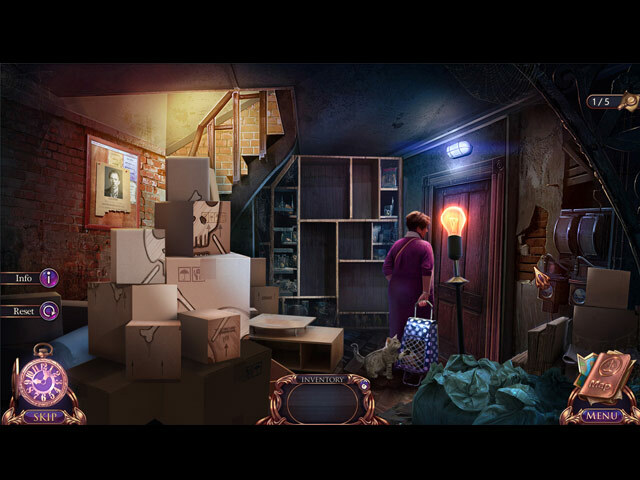 The Hidden Object Scenes are mostly Silhouetted Shape finds, and they are a bit scarce, at least within the demo time. There are however, a ton of entertaining Mini games and puzzles, ranging from simple tasks, swapping tiles or clicking on gems to change colors, others are longer and slightly more complicated. My favorite was the Fishing game where you attempt to catch fish by dropping the hook upon the desired fish, but, a frog protects the fish and you must either be faster or outwit him. The goal is to score 100 points, large and slow blue fish are worth 8 points, Orange fish are worth 10 points and the small Red fish are worth 15 points. The Collector's Edition has Concept Art, Achievements, Morphing Objects, Collectibles, Wallpapers, Music, a Secret Room, a built in Strategy Guide and a Bonus Chapter, enjoy! Rated 5 out of 5 by PATinPNS from Auntie Gray Comes Through Again This is posted after playing the entire game. Really enjoyed this one. Another hit for Elephant as far as I'm concerned. I enjoy almost everything about it. The graphics are really well done and the sound is excellent, including voice overs. Music is good and the effects are right along with the action in the scene. 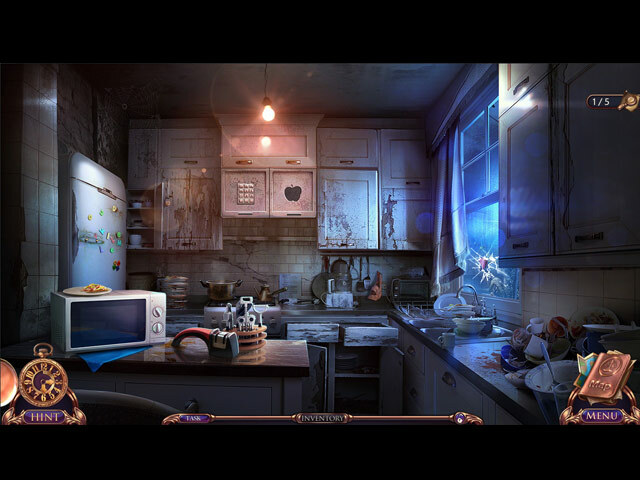 Hidden object scenes are varied and interesting. Not very hard in most instances, but it was enough for me. I did play most of the mini games for a change, so they must not be too difficult either, but again, enough for me. You have a map which shows you where there are current tasks. Every once in a while, I couldn't find anything to do and used the hint and it would send me to another area, so it isn't what is to be done right now, just to be done. There are several levels to in which to play. I played in casual so the hint and skip buttons recharge quickly. I swear I am going to get those minis where you have several different things to do to move on. I always get hung up on one segment, but one day! The story is really good. I have several of this series and I do believe this is the best story of them all. I won't go into the story itself, because Big Fish does a great job giving you the idea. No need to rehash. Just to say, it had me from the beginning. This is a fun, interesting game with numerous puzzles, hidden objects and other goodies to spend a few hours playing. I do believe you'll enjoy it too. Rated 4 out of 5 by kerith90angel from Based on completed SE. Here are details about the game, after the demo.... *********Tried not to but, MAY CONTAIN SPOILERS******* This installment of Grim Tales took me around 3.5 hours give or take. I did not buy the CE and up until now, I had bought and played all of the titles to Grim Tales as CE. I didn’t see this one had a screensaver in the demo so I didn’t buy the CE. This installment is shorter than the others. It was a good game in whole, but I felt it wasn’t the best in this series. MOST IMPORTANT THING FOR ME TO TELL YOU: Chapter 2 has a cute mini game where you sew sails for a toy ship. 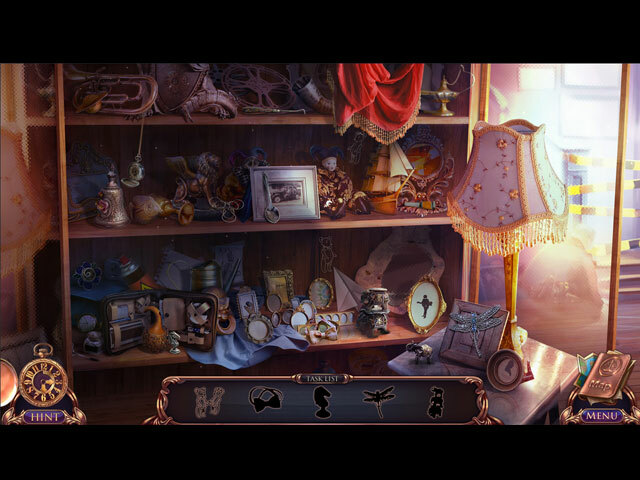 There is also a hidden object scene in Chap 2 I loved, in the Study; each item is made of 2 other items to find and apply. In Chapter 3, just before you enter the building… has a neon sign ELEPHANT GAMES. And you meet up with an electrician who had an ID card, Elephant games is also listed there. These little touches were adorable. Chap 3, once in Howard’s apartment; there is a hidden object scene of inside his refrigerator that is just gross. I would tell you why but this review probably won’t get posted. I’ve stated before, I wish the DEV were more sensitive to the fact this is a casual game and most people don’t want to see the gross things in his fridge. It was unnecessary. Like all of the Grim Tales games since Color of Fright, the game is set up with Aunt Gray’s evidence which is set up as tabs on the right side of screen. You can re-watch all the cut scenes here, as if it was a CE and it really helps with a story brush up reminder. Chapter 4 has a really great “super puzzle” mini game that requires several steps. Chapter 5 Anna goes way back to a chapter called “the town”. It reminded me of the late 1600’s. This entire level was well done. FAVORITE SPOT IN GAME IS: End of Chapter 2 into Chapter 3 there is a VHS tape you put in a tv. When you do, it plays this great cut scene that is very dramatic. When you enter Howard’s building in Chapter 3 there is one of the best mini games I have ever played. It involves several rooms to complete and has a beautiful, but angry, dog and an adorable cat. As you enter Howard’s apartment, though, the game gets much darker and took a turn for the worse for me. It was awesome though, when we finally get in to Howard’s attic. It is SUPER SPOOKY! I was actually unnerved a bit. It reminded me of how well this was done in Grim Tales Color of Fright when you see the little girl in corner during the rendition pertaining to the school for GT Bloody Mary “memory”. Both of these moments, in this series….SCARY! Scary good. HINT, DIARY, GRAPHICS, VOICE ACTORS, & MUSIC- The hint was a helpful step x step with a portal jump. I used it a lot as there is a lot of jumping in this game and trying to remember where items go is too convoluted without it. The graphics are typical Elephant Games. Also typical for this DEV the voice actors and music were both perfect. There is a great diary that keeps you informed of the story as the game proceeds. It is worth the time to stop and read it every level. IF YOU LIKED THIS GAME HERE ARE SOME OTHERS LIKE IT YOU MAY ALSO LIKE: Obviously, the rest of the Grim Tales series. Be sure to play the other Grim Tales IN ORDER…. each one mentions the last one in some way. I highly recommend ALL the games in this series. So far Grim Tales: The Wishes is my favorite. I have completed up to game 9 at the date of this review 11-16-16. I have played all of this series through, each game to the end, and only own 1 or 2 SE (this being one- because it didn’t have a screensaver.) Usually, I did buy the CE version of this title. The best Collector’s Edition in this series is Grim Tales: Bloody Mary. The screen saver alone was worth the purchase for me. It has a swan floating in a gorgeous garden pond in different shades of pink. 1. Fear 4 Sale #8: House on Black River 2. Mystery Tales: Her own Eyes 3. 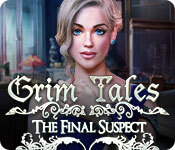 Grim Tales 9: The final suspect is the game most like #8- this one. The character Jackie is in both and I really loved this character, she is so pretty! Many thanks to Big Fish Games! And to Elephant Games… I absolutely ADORE you. This long-time BFG fan NOTICES every little detail you have in your games that some of the other developers will either not have, or only put in the demo. Thank you!